"My goal is to stay in Canada permanently"
After having worked in the Dutch vegetable sector, Wim van der Burgh has crossed the ocean this month to start working for the Canadian greenhouse vegetable giant Mucci Farms. In October, his immigration request was granted by the Canadian government, and it became possible to work for Mucci Farms. Wim, when asked how he got to work for Mucci Farms: "I’ve always been attracted to the prospect of working in North America, in either Canada or the United States. I met the President of Sales & Marketing, Danny Mucci during Fruit Logistica and we discussed the opportunity to join the Mucci Farms team. In October, the Canadian government approved my immigration application and I was able to join the organisation. I’m very fortunate to have the support of my family as this is a big life change for them as well. Although my two oldest children are staying in Holland, they’ll visit us 2-3 times per year, and we’re lucky that Facetime and Skype have made the world a smaller place." "My first impressions have been very good. The people are friendly, Canada is a beautiful country to live in, and my coworkers have a strong work ethic and desire to succeed. My goal is to stay here permanently, and we’re living in the Leamington/Kingsville area of Southwestern Ontario. You can compare this region to “Westland” as the area has the largest concentration of greenhouses in North America. They don’t call it the “Tomato Capital of Canada” for nothing! A huge part of the population in this area directly or indirectly works with agriculture." On the question what he can contribute as a Dutchman to a Canadian company, Wim answers: "Holland is still a leading country in the greenhouse produce industry in more ways than just trade. They also lead the way for growth and related sectors such as climate control and crop protection. I am certain that the Dutch “know how” is an added value to the North American greenhouse market as there are several Dutch companies and industry professionals living here. " Steve Zaccardi, sales director, adds: "We are very happy to welcome Wim in our dynamic team. As leaders in the North American greenhouse horticultural sector, with the objective of worldwide expansion, his knowledge and experience in a large range of international markets will be of great value to us." 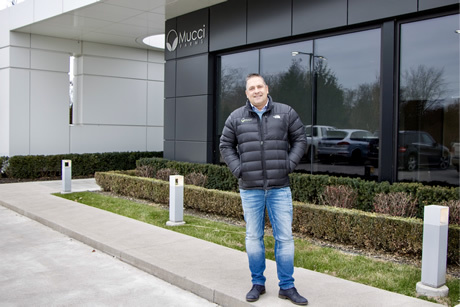 Purchase director Rob Medcalf confirms: "In the first few days at Mucci, Wim has already given us a good understanding of the European way of trading. With more than 20 years of experience in vegetables, we expect Wim to fit at Mucci Farms." Mucci Farms has been growing in Kingsville, Ontario since the 1950’s. The company also owns greenhouses in Huron, Ohio, USA along with a distribution facility in San Antonio, Texas. In total, Mucci Farms owns over 250 acres of tomato, pepper, cucumber, lettuce strawberry farms between Ontario and Ohio, and markets on behalf of over 1200 acres across North America. "We also have a satellite office in Mexico with several partnerships in the region. Sales & Marketing is largely focused on retail in Canada and the United States. In addition, we have several acres under grow lights allowing us to produce considerable product throughout the winter season. We purchase a considerable amount from North America as well as Europe, so this will be a main area of focus for me." Only living in Canada for a few months by now, Wim already ate quite a few of the famous Mucci Farms 'Smuccies'. "The strawberry growth is going very well, even better than dreamed of. We have the largest indoor strawberry farm in North America, with 36 acres under glass. The company partnered with Dutch growers, Ton Bastiaansen and Joost van Oers in 2016 and the program has been fantastic. The taste of the“Smuccies” Sweet Strawberries is phenomenal!"